Transparency Market Research has published a new report that studies the global industrial controls systems market. The research report, titled “Industrial Controls System Market - Global Industry Analysis Size Share Growth Trends and Forecast 2015 - 2021”, gives a comprehensive overview of the market dynamics governing this market and its impact on the overall economy. According to the research report, the global industrial controls system market was valued at US$58 billion in 2014 and is expected to be worth US$81 billion by 2021, growing at a robust CAGR of 4.9% from 2015 to 2021. Industrial control systems are a network of interconnected equipment that are used for supervising and controlling physical equipment in several industrial environments. These systems include numerous control systems such as supervisory control and data acquisition (SCADA) systems, distributed control systems (DCS), and programmable logic controllers (PLC). They are primarily used for remote supervision, process automation, and critical infrastructure automation. SCADA systems are employed for obtaining data from remotely placed devices such as transmitters, pumps, and valves, among others. These systems help in gathering data from faraway devices and transferring it to the master control unit for enhancing control. Distributed control systems or DCS are interlinked networks that ease the controlling activity of several processes that may be spread out over facilities. On the other hand, programmable logic controllers are deployed for making electromechanical processes such as controlling assembly lines in a factory, machinery, or light fixtures automatic. 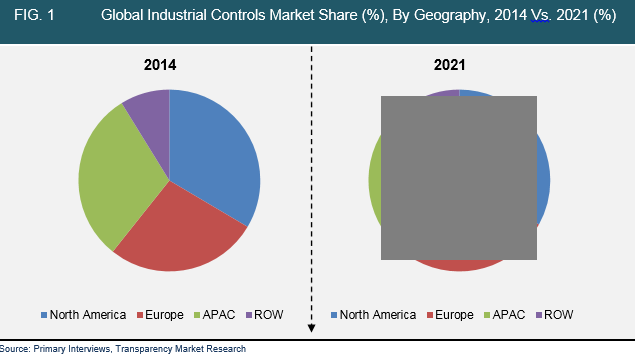 The global industrial controls system market has been flourishing due to the growing entry of automation in the industrial sector and the increasing trend of remote supervision in several manufacturing facilities. Analysts predict the increasing software application in industrial control devices is expected to increase the market shares of PLS, DCS, and SCADA systems in the industrial environment. Some of the other factors expected to contribute towards the growth of the global industrial controls systems market are the emerging economies of Indonesia, India, and China, which are making heavy investments in automation and industrial infrastructure. The SCADA segment will witness a stupendous growth rate due to increasing demand for the same in sectors such as food and beverages, oil and gas, and chemicals. The global industrial controls system market has been segmented on the basis of types, components, applications, and geography. The types of industrial controls systems are programmable logic controller (PLC), distributed control system (DCS), and supervisory control and data acquisition (SCADA). The components in the global industrial controls system market are programmable logic controller (PLC), human machine interface (HMI), remote terminal unit (RTU), SCADA communication systems, and others. The applications of industrial controls system market are seen in industries such as automotive, pharmaceutical, oil and gas, electrical power, and water and waste management. Geographically, this global industrial controls system market is spread over areas such as North America, Europe, Asia Pacific, and Rest of the World. Some of the key players operating in the global industrial controls system market are Emerson Electric Co, Siemens AG, Alstom SA, ABB Ltd, Rockwell Automation, Inc., Omron Corp, Honeywell International, Inc, and Omron Corp.